I braved the 90+ heat and humidity, and bushwhacked for about three miles through some of my favorite hidden spots today. A primary objective was spending some quality time with my Nikon D7000, which I am still very much learning. So, as I slogged through fens and woodlands, I was especially on the lookout for tiny stuff, as I really wanted to use the 105mm macro. I found lots of suitable subjects, and more on some of those later. But, the following beast was a huge bonus and a macro lens was scarcely necessary! One of the spots I visited has a grassy parking area, and I wheeled the VW into the shade cast by a handy bitternut hickory. I'm always on the watch for caterpillars, especially the one that follows, so before leaving the car I gave the hickory's foliage a good once-over. Bingo! I think this was Mother Nature's reward for me, for working with the Columbus Dispatch to develop a story that appeared in today's paper on the importance of caterpillars. READ IT HERE. A dead twig where it didn't look like a dead twig should be. A closer glance revealed movement. My lucky day - a hickory horned devil! This enormous caterpillar is sort of the Holy Grail for caterpillar-seekers, with good reason. They are spectacular. I backed the car off a few feet, jumped out and started hauling out the camera gear. Even after setting my tripod a few feet away, the devil paid no mind - it just continued slowly browsing the hickory foliage. This monstrosity was probably four inches in length, and is due to get even bigger. I'd say it's in its next to final instar. Horned devils become green in their last larval stage. I was sorely tempted to take it back home with some hickory foliage, and see if I could raise the animal to adulthood. But these sorts of things are better left alone unless you've got some really justifiable reason for collecting. At one point, I reached in to adjust a leaf, and that movement caught the caterpillar's attention. It lunged that ferocious looking horned head in my direction with great rapidity, and splayed its horns for full effect. Hickory horned devils are harmless, of course, but if you didn't know what it was, this menacing display would probably cause you to back off. If the caterpillar is threatened by a potential predator such as a songbird or perhaps parasitoid flies or wasps, this act might be enough to save it. Interestingly, a Yellow-billed Cuckoo was calling intermittently close at hand as I made these photos. Cuckoos are MAJOR caterpillar hunters, and that bird probably would have loved this thing. The tubular glutton still has a piece of hickory leaf in its jaws. Note also the curious handlike "feet" capping the prolegs. Caterpillars are eating machines, and a big hickory horned devil can tear through some serious foliage. As greenery is mowed down and sucked into the front end, the inedible remnants are constantly expelled out the back end. Hickory horned devil frass - poop - pellets can be a centimeter in length. The first one of these that I ever saw was because of its frass. The person I was with with spotted a pile of fresh frass, looked up into the tree, and there was the devil chomping away. The caterpillar was copiously beset with small branched spines. I think that most or all of these are shed when it molts into the final instar. Those are some big, powerful legs and the horned devil uses them to tightly clasp twigs. It'd probably have been some work to pry it off there, but such grasping power comes in handy during storms and the attendant threat of being blown from the tree. If all goes well and this hickory horned devil makes it to adulthood, this is what it will become. A royal walnut moth, Citheronia regalis. That's a suitably apropos scientific epithet, as both the caterpillar and the moth are certainly regal. The delightfully politically incorrect "Fat Woman's Squeeze" at Cantwell Cliffs State Park in Hocking County. I'm sure there's a story behind its naming. This narrow fissure between a massive sandstone cliff and a huge slump block that calved from the cliff's face long ago is the quickest way to get to the park's namesake cliffs. Hocking County is the next to smallest of Ohio's 88 counties, but probably generates the most ecotourism traffic of any county. The primary reason people come is because of gorgeous scenery. I like Cantwell in part because it is somewhat off the beaten path for most visitors and isn't as heavily visited as iconic sites such as Old Man's Cave. Once one has successfully navigated Fat Woman's Squeeze, this is the view: an enormous sandstone overhang. A waterfall cascades from the summit, varying in intensity depending on rainfall. It was just downstream of this point that I observed the tiger spiketail that I recently blogged about. People tend to love these sorts of places to death. Hordes of visitors stumble down and gape in awe at the rock formations. Kids and adults alike scramble over every surface that it is possible to climb upon. Dogs bark. Children yell. The most disrespectful of the lot carve or spray paint their initials or other messages that no one cares about onto the rock faces. I'd visit these places more often but the constant parade of people quickly drives me crazy. Occasionally, natural selection eliminates one when they fall from the cliffs while trying to play daredevil or get a better photo. As a consequence of all of the foot traffic, most of the highly specialized flora that inhabits sites such as Cantwell Cliffs has long been scrubbed from the landscape. The only nooks that plants hang on in are shaded moist ledges such as above. Dripping seeps keep people at bay. The rock ledge specialties that grow on these sites are interesting and in general not well known or often photographed. One of the most spectacular, round-leaved catchfly, Silene rotundifolia, with its brilliant scarlet flowers, has nearly been eliminated at Cantwell Cliffs. In the absence of people the catchfly would abound in the dry shaded sands under the rock alcove. It's all been trampled into oblivion, and only a few scattered clumps grow high and out of reach on the cliff face. A personal favorite is the dwarf enchanter's nightshade, Circaea alpina. If you pay attention to wildflowers, you undoubtedly know its larger brethren, the enchanter's nightshade, Circaea lutetiana, an abundant and widepread species of woodlands. Dwarf enchanter's nightshade is far more finicky and only grows on sandy ledges of sandstone cliffs. A big plant might tower four or five inches skyward. The flowers are miniscule; probably twenty of them could find room on a dime. A close look at their structure reveals that this plant is part of the evening primrose family (Onagraceae). Revealing the illogic of many plant names, dwarf enchanter's nightshade is unrelated to the nightshade family (Solanaceae). Even cooler, in my eyes anyway, is the much more obscure plant known as pellitory, Parietaria pensylvanica. While the tiny snow-white blossoms of the dwarf enchanter's nightshade may occasionally catch the eye of one of the cliff-fawning touristos, they'll never notice this one. This is a true botanists' plant. Pellitory is a frequent companion of the aforementioned nightshade, and the ledge upon which I made these photos teemed with both. By moving in close, we see that the pellitory is in peak bloom - that's all it does. The tiny greenish flowers are located in the leaf axils and barely noticeable. Pellitory is a member of the nettle family (Urticaceae) but fear not, it is devoid of the stinging hairs that give some of the nettle species a bad rap. It is vital to protect some of these rock shelters from uncontrolled and unregulated people traffic, or we'd lose many elfin specialties such as these plants. Fortunately, there are a number of such sites that are protected from abuse. I love to get out at night and look for critters that one doesn't ordinarily see during the day. Tonight afforded an opportunity to slip off to an interesting patch of woods just a stone's throw from my house, and the following photos were made during this brief foray. A wheel bug nymph, Arilus cristatus, stalks the leaves looking for victims. An army of predators emerges under cover of darkness, and the nighttime forest can truly be a dangerous place. One can often find "sleeping" creatures such as this beautiful long-legged fly that are normally active by day. Assuming you can adjust your camera's flash correctly, it can actually be easier to photograph animals such as this fly at night. During the day they are hyperactive and often tough to approach. A flatid planthopper at repose on a stem. Planthoppers are stipule mimics; they resemble the little flap of tissue where a leaf petiole joins the plant stem. During the day, planthoppers will nestle into the base of stem-leaf attachments and they look just like part of the plant. They become more active at night, and I saw a great many this evening. Another type of planthopper, probably one in the genus Acanalonia. Note how the wings are impressed with venations that greatly resemble the veins of a leaf. Planthoppers are great leapers, able to jump many times the length of their body. Adults and the odd-looking fuzzy nymphs pierce plant tissue with needlelike mouthparts and extract sap. I was quite pleased to shine my light on a tree trunk and see this spectacle - a common fishing spider, Dolomedes tenebrosus, in the act of consuming a caterpillar. This spider is one of the big ones, with a leg span of up to four inches. They enter homes on occasion and strike terror into the hearts of the occupants. But like nearly all spiders, they are utterly harmless unless you are something such as this caterpillar. I was able to get in pretty close, as the spider was preoccupied. In this photo, you can see her fangs piercing the caterpillar's soft tissue - a bit like jamming steak knives into a rotten banana. This is, no doubt, a very nutritious meal for the spider. To live life as a caterpillar is to live in great peril at all times. During daylight hours, birds, tachinid flies, and various parasitoid wasps will be hot on your heels. At night, hunters such as the aforementioned fishing spider lurk. So, caterpillars have evolved incredible crypsis, or camouflage. This is a caterpillar in the massive geometrid family, the adults of which tend to be plain jane little brown moths. I noticed it because this "twig" was dangling where a twig shouldn't be and a closer look revealed the silken strand from which the caterpillar was dangling. I gave the caterpillar a tap or two and it scuttled up its silken rope and adopted the classic inchworm pose that gives this group of caterpillars the name "loopers". During the day, loopers such as this one affix themselves to similar sized twigs and freeze stiffly in place. Good luck spotting one then. This locale always has a decent population of oblong-winged katydids, Amblycorypha oblongifolia, and their song is rather easy to learn. It sounds rather like a frog to my ear; sort of a rib-itt! The song has good carrying power and can be heard some ways off. The katydids are not particularly shy and it usually isn't too hard to find one of the singers. I caught this one in the act of "singing". To make its call, it rubs a file-like projection across a roughened "scraper". That brown area just behind the head is termed the stridulatory area, and the animal is revealing its translucent wing bases as it rapidly vibrates the wings and scrapers to create its song. A well-shaded sandstone gorge in Ohio's Hocking Hills - perfect habitat for one of our most interesting - and rare - dragonflies, the tiger spiketail, Cordulegaster erronia. The small stream at the gorge's bottom essentially originates at the upper end of the photo, where a falls plunges over an impressive several story tall sandstone cliff. Overarching hemlock, birch and other trees insulate the stream from direct sunlight, keeping its waters cool. Hillside seeps add a constant infusion of cold groundwater, and decomposed sandstone forms plenty of saturated soft sandy margins to the stream. I was in this gorge the other day looking for rare plants, specifically the tiny triangle grapefern, Botrychium lanceolatum. There is a small population here which I hadn't seen for about seven years, and I was able to refind it. This elfin fern only stands perhaps two inches in height - at least these plants - and one can scarcely see them in the gloom of the forest floor when standing upright. But I got a real bonus on the trek to the fern. While admiring a small population of rough sedge, Carex scabrata, near the stream's bank, a large black dragonfly prominently banded with yellow and sporting luminescent green eyes zipped by, low over the narrow stream. Tiger spiketail! This is a fascinating insect; one of my favorites. It is a high-end predator and it probably wouldn't be far afield to compare the dragonfly to the sharp-shinned hawks that nest in this forest. Like the bird, spiketails require large blocks of intact forest, defend large territories, and are sensitive to disturbance such as logging. Plus, they just look VERY COOL. Ohio dragonfly expert Bob Glotzhober says a patrolling tiger spiketail resembles a miniature B-52 bomber. I like that analogy, and they do indeed suggest a small aircraft as they cruise low over the stream's waters, ranging from one end of their turf to the other. My lucky spiketail day had just begun. After the dragonfly shot by, I readied my camera and prepared to settle in and hope for some shots. My experience with tiger spiketails is that they make systematic patrols, but it may take several minutes before the animal returns to a given spot and you've got to be ready or you'll miss it when it flashes by. No worries. This spiketail turned out to be a female, and she selected a nice wet sandy flat about ten feet away to place her eggs. She shot in, hovered over the stream, turned to glare at the interloper - me - and then went about her business while I watched quietly from the shadows. Eventually I was able to creep into the center of the stream without disturbing her and make photos and watch the ovipositing process at remarkably close range. Tiger spiketails place their eggs in permanently saturated sand in or along the margins of small order streams. "Place" might be putting it a bit delicately. Rather, the female violently lunges the tip of her abdomen and the ovipositor into the sand in the manner of a pogo-stick, making about one thrust per second. Forgive the less than crystal clear photos, but shooting rapidly moving dragonflies in deep shade is not the easiest task. In the above photo, her abdomen tip is in the shallow water and making contact with the substrate. 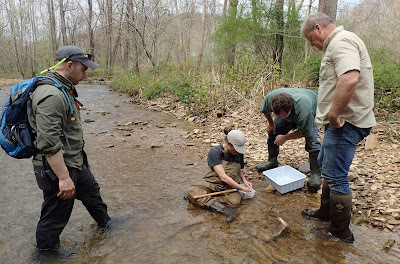 The water at this ovipositing site was not even an inch deep. She drilled in a lot of eggs, making many dozens of lunges in the short time I had to observe. Two other hikers stumbled along and made the stream crossing at this point, spooking the dragon and ending my study. This video should speak a thousand words about the tiger spiketail's ovipositing technique. It isn't the greatest video - my camera wanted to focus on the backdrop rather than the dragonfly - but she's clearly visible and you'll certainly see her style. The tiger spiketail was a great bonus to an already highly productive field day. I suppose I ought to put this caveat right up front: if, for some reason, you detest serpents you probably won't like these photos. In fact, I'm sure you won't. So if you are a ophidiophobe, surf no further - turn back, I say! Chances are, you already picked up on the snakiness of this post from the blog's title, and haven't even made it this far. Your loss. This is cool stuff. 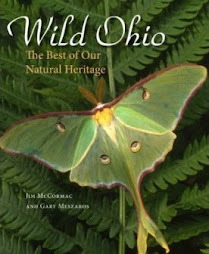 My friend Ann Bonner, who is a forester living in Athens County, sends along the following photo. 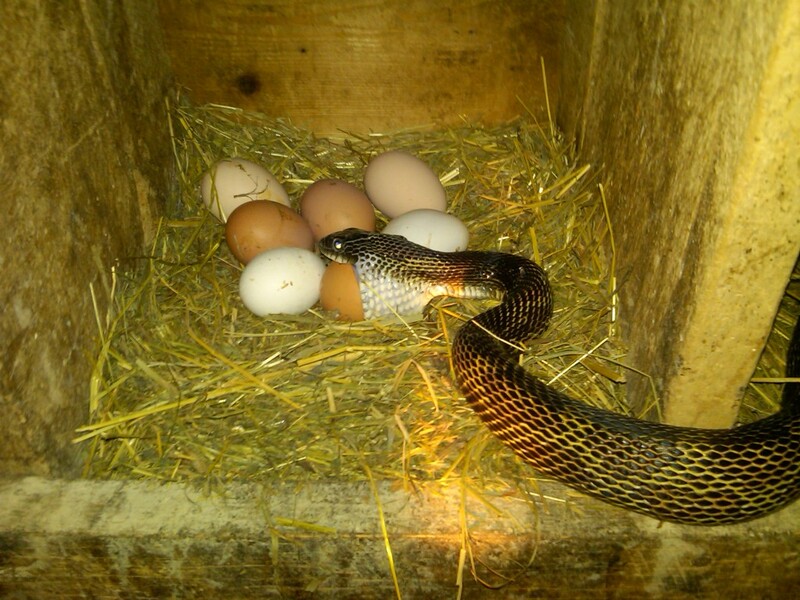 What's more, she thinks this is very cool, and the snake is in HER chicken coop! I love it. Here's what she told me: "Since this guy has been hanging around the last 2 yrs, no rats in the coop. That is worth a few eggs now and again". When I asked for permission to share this photo, Ann made me guarantee that I wouldn't make the snake out to be a villain. Silly girl! Of course I wouldn't! And I love her mentality regarding the animal. Your average chicken farmer would pulverize that snake with a long-handled rake in the blink of an eye. 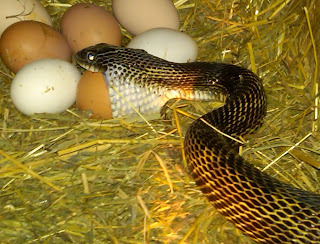 The two and a half foot long black rat snake, Pantherophis alleghaniensis, caught in the act of swallowing - whole! - a chicken egg. A small salary to pay, thinks I, for his ratting and mousing services. Black rat snakes are very common in much of Ohio, although like many serpents they've declined considerably in well-settled areas. NOTE: The taxonomy and nomenclature of this species has been somewhat unsettled in recent years, it seems, but these are the common and scientific names that I am using. We crop down the photo a bit, as I know you really wanted a closer look. Snakes have incredibly flexible lower jaws, and we can see the amazingly elastic expansion of the snake's mouth to accommodate this large chicken egg. That meal would be comparable to you or I swallowing a basketball. Your narrator holds a black rat snake that I caught a few years ago in Muskingum County. It was crossing a country lane, and I wanted to move it before it got run over. This one was pushing five feet, but black rats can get a lot larger than that. The record is supposedly 8 feet, 4 inches. On two occasions I've seen black rats that were well over six feet in length. Such a big reptile can be understandably intimidating, but normally they are quite docile. The one that I'm holding took one feeble, half-hearted swipe at me when I first picked it up, then settled down and was completely passive. Thanks to Ann for sharing her photos and story, and I nominate her for the as yet to be created Friend of the Snake Award. I was able to stop in at Hide-A-Way Hills briefly yesterday morning, and check out Ohio's only currently known nest of Mississippi Kites. I recently wrote about these kites HERE, and HERE. As previously reported, there is one chick in the nest, and it is continually being stuffed with cicadas and other goodies by the adults. As a consequence, Junior is growing like a weed, but is still heavily beset with white down and is still a ways from making its inaugural flight. It appears that we are still on track to aim for Saturday, August 13, for the 2nd annual Kite Day. Thanks much to Melissa and Elizabeth for getting me into the high security Hide-A-Way Hills compound so I could make these photos and issue this update. And please forgive the lack of crisp frame-filling photos. My biggest lens is a 300 mm, and we really need the big boys and their 500 and 600 mm's to adequately deal with these high-flying kites. An adult Mississippi Kite launches from its favorite sentinel tree, just a stone's toss from an active nest. We saw both adults, and one or the other would spend a fair bit of time at the summit of this tree, scrutinizing all of the happenings in the area, including us. At one point, a Pileated Woodpecker foolishly entered the sphere of the large white ash in which the kites have made their aerie. As if shot from a cannon, the guard kite hurtled from its perch and into the ash, bushwhacking the woodpecker and delivering a raking blow. In turn, the woodpecker bolted from the tree is if he had been shot out of a slingshot. An embarrasingly ungraceful landing. We pretended not to notice. Once airborn, Mississippi Kites are impeccable aviators. An adult wings towards the nest, carrying prey which is probably an annual cicada. As dramatic evidence of their flying abilities, the kites deftly pluck these fast-flying if somewhat clumsy insects from the air. Much more impressive is ther ability to snag dragonflies on the wing. Few animals can outfly a big dragonfly, but they've more than met their match in these kites. This shot shows the incredible versatility of the wings and tail of these birds. While a Mississippi Kite is not all that much smaller than a Peregrine Falcon in dimensions, it weighs little more than a third the weight of the falcon. This translates to an incredible bouyancy, and an astonishing ability to jig, jag, dive or accelerate with extreme rapidity. Small tweaks and flicks of the tail or primary flight feathers send the bird onto a new course, instantly. If using a car analogy, the kite would be a Mazda Miata, the falcon, a Bugatti Veyron. Not every scrumptious cicada is delivered to Junior - the adults have to eat, too. Here, one eats its prey on the wing, adeptly transferring the morsel to its bill while tracing languid circles high in the sky. It's hard to see through the dense foliage, but that's the nest with an adult kite stuffing something into the young kite. This nest is in a good place, high in the spindly boughs of a white ash, where few predators of substance can get at it, and where the adults can keep an eye on it. Except, they chose an ash. We've not yet seen any sign of the emerald ash borer here, but it's coming. That's another story, though, and we - or the kites - don't have to worry about that issue in Hide-A-Way Hills at least for a while. Stay tuned for kite updates. The mausoleum of Fred Lazarus and family members, Green Lawn Cemetery, Columbus, Ohio. I was down at the cemetery last Wednesday, and snapped this photo as Lazarus is central to this story. Fred was the son of Simon Lazarus, who founded the now extinct F & R Lazarus & Company stores. Fred served as president of the company, and like many of the Lazarus family members, lived part of his life in Cincinnati. Lazarus later became part of Macy's, which of course still goes strong. 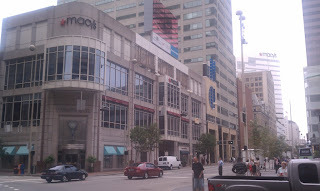 I took this photo last Tuesday at a downtown Cincinnati intersection, and the Macy's empire is a dominant fixture of the scene. Anyway, back in 1952, a then young member of the extended Lazarus clan named George Rau lived in Mt. Lookout, a Cinci suburb. While visiting the area of Lake Garda near Milan, Italy in 1952 on a family vacation, George took a shine to the local lizards and stuffed some in his luggage, importing them back to the Queen City. Upon return to the Mt. Lookout compound, he liberated the reptiles; a species known as the common wall lizard, Podarcis muralis. They flourished in the Queen City, and have come to be known locally as the "Lazarus Lizards". 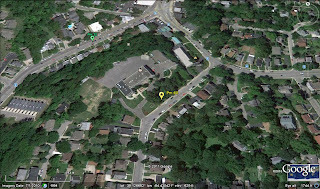 Typical wall lizard habitat as seen from Google Earth, this particular neighborhood on Cincinnati's southeast side and not far from the Ohio River. 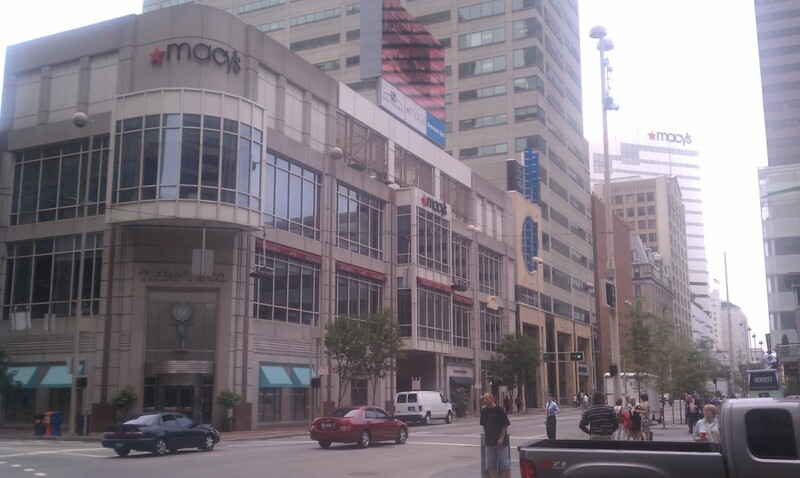 And here we are at street level. See that wall by the sidewalk? There are wall lizards living in it. 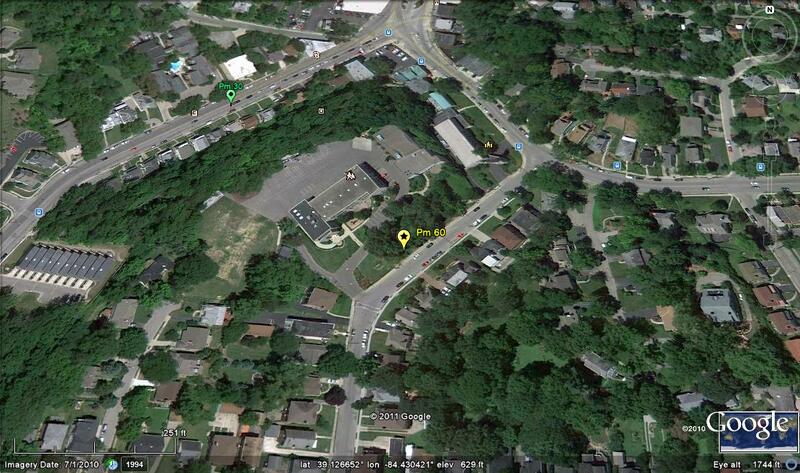 And about every other wall, rocky foundation or outcrop, and stony spot in many parts of the city. Get yourself into a good wall lizard locale, and it won't be long before you see one. Like barely glimpsed wraiths, the wary little lizards scuttle off at lightning speed, causing one to wonder if they were seeing things. Get out on foot and start stalking the little animals and it won't be long before you manage good looks. And a big dose of surprise as to just how many there are. Herepetologist Jeff Davis holds a wall lizard shortly after capturing it along the street in the previous photo. 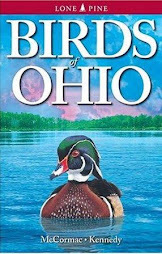 Ohio has a long and storied history of herpetology, and has been home to some of the country's foremost authorities on amphibians and reptiles. 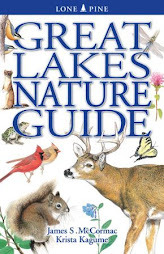 Jeff is one of them, a leading expert on Ohio's herpetofauna and author or coauthor of several publications about the state's amphibians and reptiles. I was in Cincinnati last Tuesday to speak at a conference, and connected with Jeff beforehand to see if he'd be willing to meet me afterwards to look for wall lizards. Jeff lives in the Cincinnati area and his lab at the Cincinnati Museum of Natural History is just ten minutes from the conference I was at. So it was a go, and thanks to Jeff I was able to add this scaley oddity to my list, and more importantly learn more about wall lizards and how they operate. The common wall lizard is a thing of great beauty when seen like this. Most people just get glimpses of linear little streaks dashing over the curb, but we were persistent and finally ran one into the grass, where its progress was impeded. With a quick pounce, Jeff was on it. Note the lichenlike blotchy dappling of the skin. I would imagine this pattern evolved to help the animal better blend with lichen-encrusted rocks. Those eyes work very well. These lizards are incredibly wary and impossible to sneak up on. Usually, it was tough to approach one within ten or fifteen feet before the animal would scuttle off into a crevice or dense vegetation. This is a male, its skin highlighted with a row of beautiful blue dots. Upon close inspection - click the pic for expansion - the skin resembles an ornate tapestry of small woven beads. Here we can see the reason for the lizard's nearly supernatural ability to zip around vertical surfaces in a manner that would put Spiderman to shame. The toes, especially those of the back feet, are abnormally long and a great adaption for clinging to challenging surfaces. From its humble start of ten lizards in 1952, the Cincinnati wall lizard population has ballooned to perhaps 200,000, maybe more. They are abundant in many neighborhoods and well known to local citizens, and have expanded very locally into neighboring Indiana and Kentucky. How far they get remains to be seen. The ecological impacts of having perhaps one-quarter million introduced lizards running about can't be good, but it is difficult to ascertain with certainty exactly what damage they have done. Wall lizards, given their success, must have had a role in reducing native lizards such as eastern fence lizard and five-lined skink, which are rare or absent where the wall lizard occurs although both used to occur in this area. I appreciate Jeff taking me to see some of these curious little lizards, which certainly qualify as Ohio's oddest tale of reptilian introduction. probably not as likely) at Apostle Islands National Lakeshore, WI in 2006." along US-2 in the Upper Peninsula." A "chameleon" frog and a murderous "bumblebee"
Midwest Birding Symposium - get yer tickets, NOW!